This year we celebrate 6 years since the formation of the Friends of Montefiore Woodland Group during which time considerable improvements can be seen thanks to the efforts of our volunteers. Each year we see plants looking stronger and more established in the improved environment. We are already enjoying spring flowers – daffodils, primroses and violets. Summer will see the flowering of the meadow and last autumn there were crab apples and we harvested our first hazel nuts – not a huge crop but we all got to sample them and they are sweet and delicious. Several more hazel shrubs have been planted so we can look forward to more nuts unless the squirrels get there first. Thank you to Peter for advising and keeping a record of all plant species in the Woodland. Over 60 different species were identified in 2017. Monthly Woodland working sessions prove to be friendly and enjoyable occasions. This year we were pleased to welcome several newcomers who we hope will continue their support in the coming months – many hands make light work. Dave Welch has again acquired loads of wood chippings which are spread along the footpaths to make them more user friendly and to deter people from trampling other areas. The nesting boxes have been maintained and Pat and Gerry Short continue to top up the bird feeders, which attract a variety of birds to the site. Provision of water for the wildlife is not easy as there is no water supply on the site. We have installed a shallow water container, which is certainly being used but needs regular topping up. The Friends group participated in the national Big Garden Bird Watch, recording 12 different species. Sue Smith continues with the weekly butterfly transect from April to September and the Friends group also participated in the national Butterfly count recording 8 different species on the day. The total number of species seen within the woodland now stands at an impressive 17! The wildflower meadow showed some improvement this year, more wildflower species have been planted as well as buckthorn with a view to attracting more butterflies. Thank you to Dave for the annual cutting at the end of the summer. 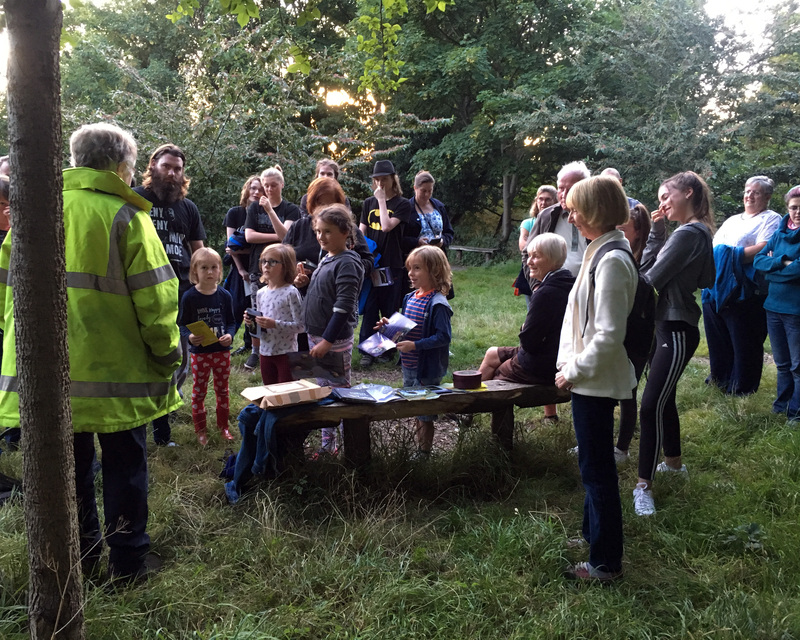 Bat walks on summer evenings were again very popular attracting people of all ages. We are able to lend bat detectors on the walk but some of our enthusiastic regulars have now bought their own. After each walk a request is made for voluntary donations, which are forwarded to the Kent Bat Group in support of their work. The collection and removal of rubbish and dog waste continued to be a major problem with the council failing to collect. Following on a road traffic incident which saw part of the flint wall demolished and the bench and bins destroyed and after many complaints and consultations with the council’s officers some of the bins were re-sited and another has been removed. The flint wall was repaired to a very high standard. Georgian Builders advised the removal of some saplings and the accumulated earth that had built up over time as this was and may cause additional problems in future. Our thanks to Ron Newman for tackling this problem with the help of a digger. During the removal of the earth we made an interesting find of an intact old local TOMSON & WOTTON, LIMITED beer bottle! Graffiti has been less of a problem as the thorny plants along the foot of the wall take hold and ivy continues to mask the wall. There has been evidence of occasional rough sleepers using the woodland but they have not presented any real problems and their stays have been brief. We are very grateful for the donations received from supporters this year. We also owe thanks to the Montefiore Arms who kindly allow us the use of a room for our committee meetings and to the Racing Greyhound for the AGM meetings. Sue and Peter Smith continue to do an excellent job in keeping the website up to date and looking good. We also have a Face book presence which is useful for announcing current events. Most of all we must thank our committee members and the volunteers who give their time and effort to maintaining and improving this little haven.